“Health is wealth.” “A sound mind in a sound body.” The adages can be better described as truisms today. For, the importance of good health is not lost on anyone. Yet, even the most disciplined individuals can fall off the health bandwagon when life comes in the way. It was these exigencies of life – long working hours, shoot schedules, frequent travelling – that put fitness enthusiast Gul Panag’s exercise regimen on the back-burner. For many, the actor-entrepreneur was still a fitness role model. But having been brought up in a family where being physically active is a way of life, she knew she could do better. So, after six months of sporadic workouts, she decided it was time to put things back on track. On March 31, she went on a 14-day fitness challenge, where she ran, swam, cycled and undertook interval running and training, all while posting her progress on social media. Her companion throughout the challenge was her father, Lt General HS Panag (retd), who in turn has been her role model for fitness, among many other things. The duo kept track of each other’s daily fitness regimen through an app, each pushing the other to do better. Spread across two states – Lt Gen Panag divides his time between Chandigarh and his native village, and Gul is Mumbai-based – the challenge got endearingly competitive at times, where he cycled for long distances on the boulevards of Punjab, while she tried to match up with an array of activities in the Maximum City. “All my life, I have seen my father as a supremely fit person. 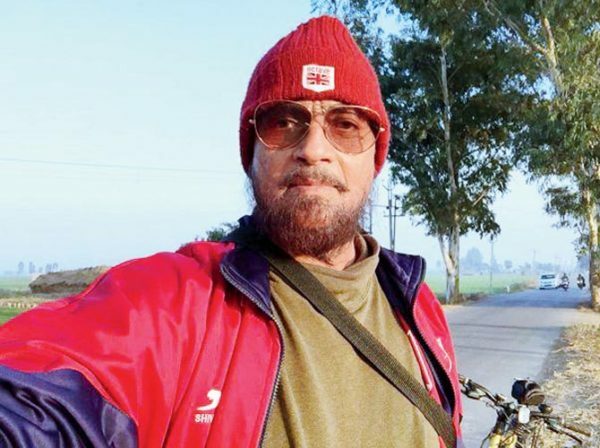 At 69, he cycles for 30 to 40km every day. In fact, it was he who introduced me to running when I was 15. So, I didn’t need to be convinced of the health benefits of being active. It was like I knew every recipe, but I wasn’t cooking,” she says. “Restarting an exercise regimen can be almost as hard as starting from scratch. One needs a goal, motivation, perseverance and of course, commitment… So I’ve decided to make a public commitment to achieve my personal goal…” admitted Gul on day one. She started with running a distance of 3km and followed it up with free-hand strength exercises, while Panag Sr continued with his 30-plus km of cycling, burning way more calories than his daughter. On day four, Gul took up high-intensity interval training (HIIT) and worked on her abs. The following days, she gradually increased the distance she ran. Day 10 was about interval running and upper body workout including push-ups and surya namaskars, while day 11 was a recovery day with a brisk walk and abdominal exercises. The day’s posts also featured positive fall-outs. “The goal wasn’t to lose weight. But this pair of jeans now has two-finger room,” Gul captioned a picture. By now, her Twitter timeline was showing posts by people who had started with their own fitness routine inspired by the challenge. Day 12 was a 30-minute brisk walk, followed by HIIT using tabata (a form of training featuring exercises that last four minutes). By now, she had also begun to catch up with her father. The penultimate day of the challenge, however, began with a hurdle. “Didn’t feel up to doing anything today at all,” Gul confessed, but added that working towards a goal means doing things one doesn’t feel like doing. And she went out for a run anyway. The final day of the challenge included a 3.5-km run, 14-km indoor bike ride and 550-metre swim. “It was a bit of a stretch, but why not? Setting a triathlon as my next goal,” posted Gul. The very next day of the challenge, Gul had to travel for her upcoming film. But things were different this time. “Once fitness becomes a part of your routine, you find time, not excuses, to work out. Fitness, after all, is a journey, not a destination,” she says, adding that she now makes it a point to include some form of physical activity in her day, however busy she may be. “If I am shooting, I wake up half an hour earlier to work out. If I have an early flight, I get some exercise after I reach the destination,” she elaborates. This flexibility, too, is an attribute she has learnt from her father. While running, endurance and strength training were part of his life in the armed forces, he switched to cycling when his knees began to give him trouble. “After 44 years in the Indian Army, fitness is now a cultural issue, and I had to pass it on to my children. Because Gul had been introduced to running, swimming and other sports by the time she was 15, when she entered Miss India at 20, good gait, agility and fitness were a part of her being,” he shares. He adds that after the challenge, they haven’t stopped with their exercises even for a day. “With the help of modern gadgets, we track each other continuously. Exercise brings you happiness and the best part is, you can become fit at any age,” he signs off. Gul Panag’s background in fitness gave her a head start, but you too can incorporate movement into your lifestyle by listening to your body. “Set yourself a fitness goal that you can sustain over a period of time, and let it evolve as you get better,” says movement specialist and lifestyle coach Ritesh Shaiwal. He insists that maintaining the right form is crucial to avoid injuries. The warm-up and warm-down process, as Shaiwal calls it, must be adhered to always. “The right sequence for a warm-up session is mobilisation of joints, followed by the cardio element and then specific stretches to improve the specific movement you will perform,” he explains. Warming down involves static stretches and movements like forward bends to get the blood flowing back to the brain. Eating right throughout is important. ” whatever you eat has to be earned,” Shaiwal sums up.